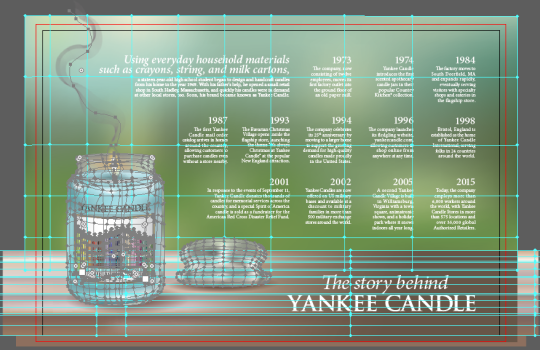 A brief history of the initial start and rapid growth of Yankee Candle through the years. It all started with one teenager’s simple homemade candles that he created using crayons, string, and milk cartons, and since then, the company has become a well-loved symbol of American pride. I designed this poster in the classic brand style of Yankee Candle, with photorealistic illustrations, a natural outdoor environment, and traditional type treatment. The contents of the label relate to the header above the candle that explains their significance – it draws the viewers in and encourages them to continue reading past the large text. 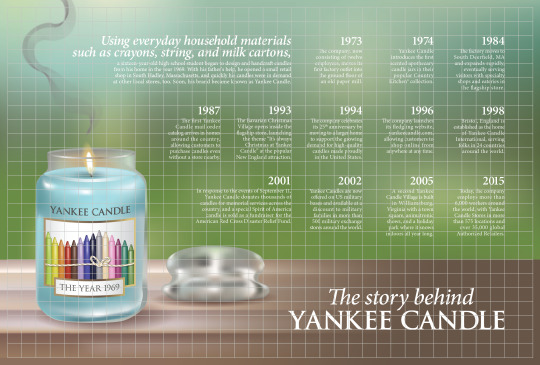 After the first paragraph, each new date tells a different story about Yankee Candle’s success and further integration into the hearts of American citizens, ending with current statistics that show how far the company has come since that initial homemade candle. Click here to view the rest of the portfolio piece on my Behance page. Above is the grid layout that I used for my poster and below is the breakdown of shapes and gradient meshes within each object. Everything was drawn from scratch in Adobe Illustrator.